What is the return program? The Lexmark return program is an environmentally-friendly scheme run by Lexmark for the collection of used print cartridges so they can be recycled. The return program Lexmark MS610dte toner cartridges are sold at a discount versus the regular Lexmark cartridges in exchange for the user's agreement to return the empty cartridge(s) after use so that they can be recycled by Lexmaark. Freepost packaging should be included with your new Lexmark MS610dte return program cartridge. Don't be fooled by the small size of the Lexmark MS610DTE printer. This modern equipment can deliver high-quality documents at a quick speed and it offers built-in Ethernet plus features a touchscreen display. The reliable and network-ready Lexmark MS610DTE laser printer has a monthly duty cycle of 150,000 pages and a maximum resolution of 1,200 x 1,200 dpi. The MS-610DTE monochrome laser printer does not come with standard Wi-Fi connectivity, however. The Lexmark MS610DTE laser printer measures 16.3 x 15.7 x 15.6 inches and weighs 46.1 lbs. It has a 4.3 inch colour touchscreen display plus a numeric keypad and function buttons on its control panel. For connectivity, USB and Ethernet ports are offered. The black and white Lexmark MS610DTE can handle 1,200 pages at a time but it can be upgraded to 2,300 sheets. Print speed can go as fast as 50 ppm. This model is integrated with 512 MB of memory but it can be expanded to 2560 MB. Users can expect high-quality output from the Lexmark MS610DTE mono laser printer. Time can be saved in the office as this device has high paper handling capacity and quick print speed. It has a built-in automatic duplexer to lower paper waste plus it has Ethernet for networking. 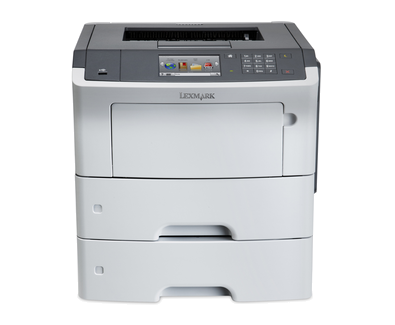 The Lexmark MS610DTE workgroup printer is very easy to use and also offers a handy USB host. The touchscreen display can be customised to give the apps users' needs the most. Featuring innovative Lexmark Unison Toner to optimise performance, this printer delivers consistent image quality every time with genuine Lexmark MS610DTE cartridges installed. Printing directly from mobile devices could be easier if this device came with built-in Wi-Fi. The Lexmark MS-610DTE printer is quite expensive for a monochrome laser printer. In most circumstances, the MS610DTE printer model is not sufficient for large offices.